From left: Guyana’s Ambassador to Suriname, Mr. Keith George, Director General (acting) of the Ministry of Foreign Affairs, Mrs. Audrey Waddell, Minister of Foreign Affairs, Mr. Carl Greenidge and President David Granger offering their respects to the late Mr. Arlington Bancroft. Guyana’s former Consul General in Nickerie, Suriname, Arlington Bancroft has passed away. Bancroft, who was based in the border district of Nickerie where he served the Guyanese community, died on March 21, 2016 at his residence in South Ruimveldt, Georgetown. Prior to his appointment as Consul General in 2002, Bancroft had served as First Secretary at Guyana’s Embassy in Paramaribo, Suriname. 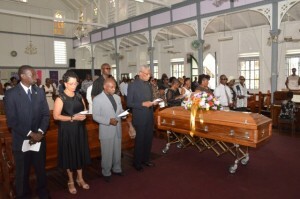 The former teacher at North Georgetown Secondary School was buried Saturday, March 26, 2015. 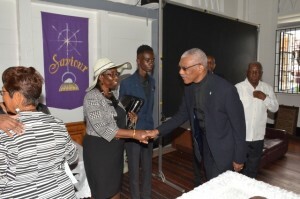 Those attending the funeral service included President David Granger, Director General of the Ministry of Foreign Affairs, Audrey Waddell and Guyana’s Ambassador to Suriname, Keith George. After Bancroft demitted office and returned home due to prolonged illness, he was succeeded by Esther Griffith, former Chief of Protocol at the Ministry of Foreign Affairs.